Declare your love for your zombie lover with meaningful zombie gifts for Valentine. Valentine’s day gifts for zombie lovers need not be scary, in fact, these could be soft and cuddly with a big red heart filled with loving memories or is it brains? Whether it’s a soft plush zombie toy or a zombie incense holder, your zombie Valentine gift will be much cherished and loved. Ghoulishly popular Valentine gifts sure are freaking fun! Cuddling a zombie plush toy while watching a zombie show feels wonderful if you are a fan of zombies or Walking Dead. Zombie Valentine teddy bears, a Dead dude, a cute zombie monster or a pretty scary plush zombie doll with deadly loving messages will make great gifts for zombie fans. 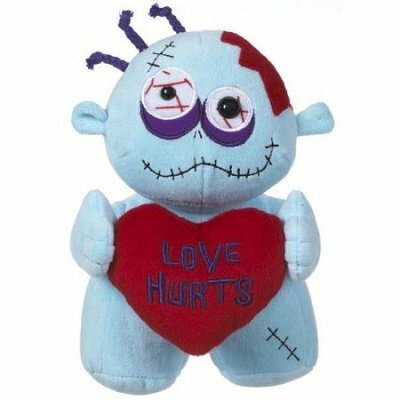 This standing 100% blue polyester fiber zombie monster doll is holding a big red plush heart with the loving zombie message ‘Love Hurts’. Yes, zombie loves you so much that it hurts. The zombie doll comes with 2 black beads eyes, one smaller than the other. Stitched scars and a crocked smile give it a more authentic zombie look. The height of this doll is 7.5″ and filled with poly fiber fill for that plush feel. Zombie lovers will find this cute and adorable. Being not too gory, even zombie loving kids will love these too. 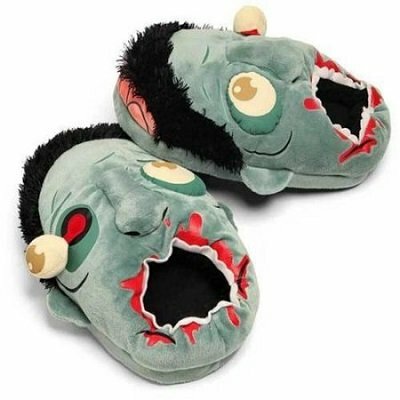 These oversized plush zombie head slippers do not come with a right or left foot. It is a one size fits most up to a size 12 for men. These cute plush greyish-green slippers come with nice details such as hanging eyeballs and exposed brain. ‘Zombies eating your feet’ will certainly appeal to zombie enthusiasts. Surprised your loved one or coworkers with a zombie desk accessory. Get some macabre attention, watch your friends freak out with this rather gory looking undead desk accessory. That would be fun? 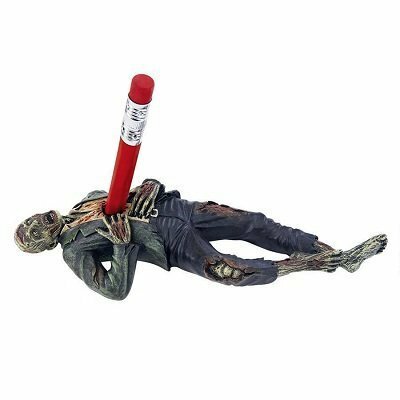 Made of quality designer resin, this gory desk accessory measures 7″ in length and 3″ in width. It weighs about 4.8 oz. This zombie pen or pencil holder is hand painted with all the gory details of the rotting undead. You get the bloody face, neck , hands and legs wounds, blood splattered shirt, rotting teeth and the usual creepy stuff associated with the zombies in all its amazing details. You can impaled this zombie with a pen/pencil (pen/pencil not included). This dead zombie comes with a dark red pen/pencil holder hole right at its chest. There are lots of lovely unique zombie Valentine gifts for him and her such as zombie salt and pepper shakers, zombie ashtrays, incense holder, coffee mugs with undead messages, mobile phone holder and lots more, each just as gruesome as the other. 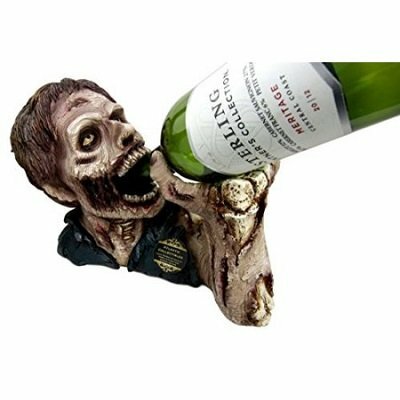 Are you looking for the zombie head ashtray for your walking dead lover or cool gory zombie kitchen gadgets for the zombie mom? Look what I found selling online. There’s a unique Valentine gift for each and every zombie lover. 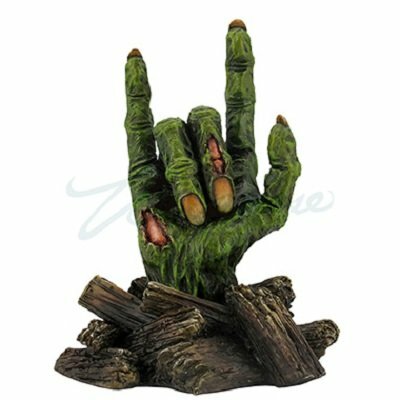 This ‘I Love You’ zombie hand sign is made of polystone. It is about 5.75″ in height. Say ‘I Love You’ zombie style to the one you love – your zombie lover. Though not exactly a zombie but just as scary and spooky. Lift up the top part of the skull head to reveal an ash tray on the lower part of its spooky face. Hand made from cold cast resin, the head measures 4 1/4″ x 6 1/4″ x 4 3/4″ high. 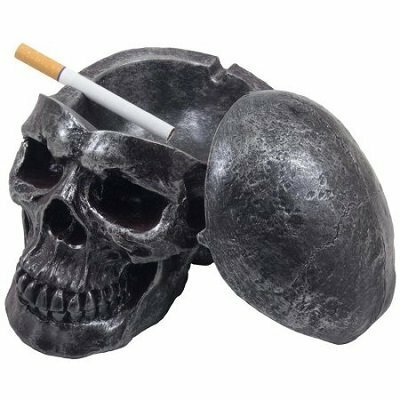 This spooky skull ashtray has a weight of 1.30 pounds. Gory details such as hollow eyes, sunken mouth and ugly teeth with its big gaping nostrils add to its deadly charm. 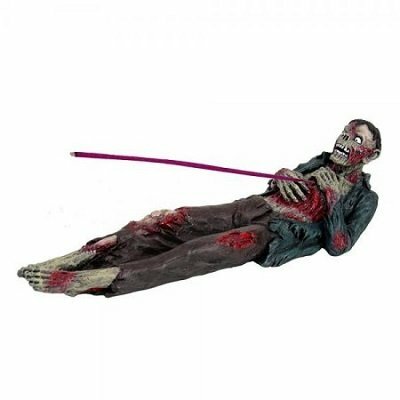 Made from cold cast resin, this zombie incense holder comes at a length of 9.5″. You poke the stick of incense through its heart. Made of cold cast polyresin acrylics, this zombie salt and pepper shaker holder is hand painted and polished. It measures 6.5″ L x 5.5″ H x 4″ W, it comes with all the fine gory details fit for a zombie figurine. 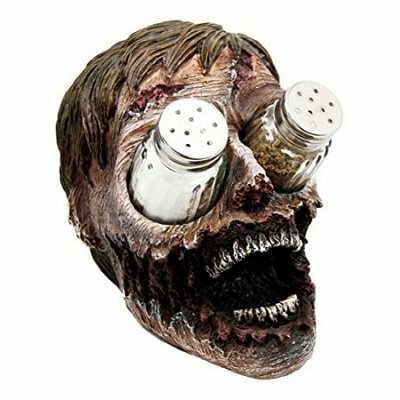 It does look creepy and scary with the 2 shakers in its eye sockets and its wide gaping mouth with the rotting teeth, a must-have for the zombie home cook. This cold cast resin zombie head is made in such a way that its hands and mouth can hold most 750 milliliter wine bottles at an angle. This helps in preserving the life of the cork. It measure 12″ L x 8″ H x 6.5″ W.
Hand painted with minute details of rotting flesh and all, this undead zombie wine bottle holder makes a lovely Valentine’s day gift for your zombie wine drinking friend. These coffee mugs can be cute and captivating even though gory looking at the same time. Your coffee lover zombie friend would be delighted to have their morning-pick-me-up cup of coffee with such mesmerizing zombie coffee mugs. 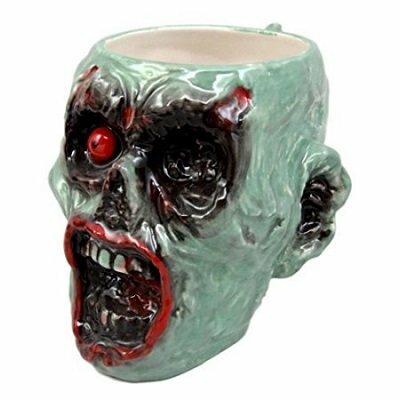 Made of quality ceramic, this grotesque zombie mug is certainly not every one’s cup of tea or coffee but your zombie lover will most probably love it because of all its gory details. Well, this mug certainly passes all the scary criteria to qualify as a scary zombie coffee mug. If you are looking for a less scary zombie coffee mug, then this mug with the vegan zombie looking for graaains instead of brains would certainly appeal to you. Perhaps you prefer a personalized zombie coffee mug for Valentine with your very special message which is indeed a meaningful and thoughtful gift. More lovely zombie coffee mugs for your zombie lover that are fun and useful. 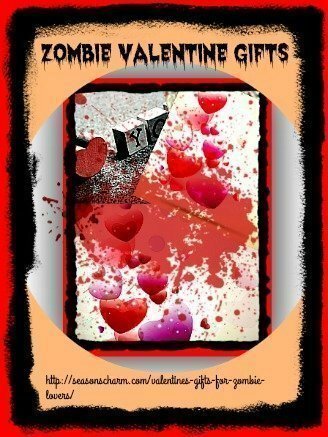 These Zombie Valentine’s day gifts make wonderful housewarming gifts too, especially during the season of love.